I recently attended a tasting by the Wine Society and worked my way diligently through the 30+ wines on show pausing only to nibble on a dry water biscuit every now and then. For those who do not know the Wine Society is a members only society set up to buy good quality wine for sale exclusively to it's members. Set up in 1874 it is a little old fashioned, but not out dated, has long standing relationships with many of its suppliers allowing it to negotiate some excellent wines and prices. There are always plenty of people dressed in tweed and a good number of very fine waistcoats were in evidence also. I don't intend to dwell on any wines that didn't float my boat however what did become apparent over the course of the tasting was that price didn't always mean a more enjoyable glass of wine and that where price did indicate an upswing in quality it was often slight. There are no scores as only a brief impression was gained but here we go. 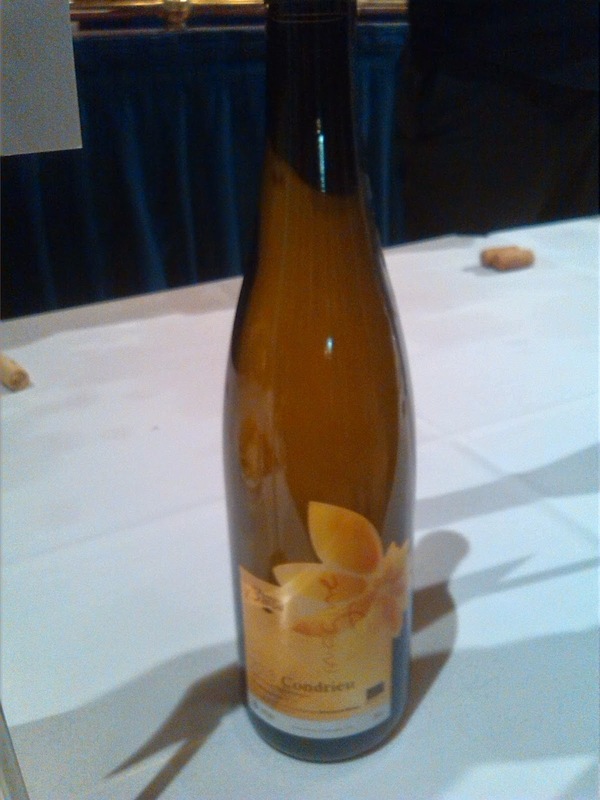 Condrieu is a wine made from the Viognier grape in tiny quantities hence the price tag there were three Condrieu on the tasting and for my money this was the best of the bunch. The aroma was floral and pretty, lovely mouthwatering acidity which gave balance on the palate to the bright peachy stonefruit. This was broad and mouthfilling without being flabby and a wash of lingering minerality on the finish. Quite light and sprightly on the palate there was a very fine elegance to this wine which would happily pair with Lobster, Crayfish or good meaty Scallops. The Domaine is a small family affair producing wines in St Jospeh and in Condrieu producing organic wines. The yield is carefully controlled to increase the quality of the fruit and the use of sulphur is minimised through the use of companion crops. Whether it is fair to say this care and commitment is reflected in the wine is impossible to say but it certainly stood head and shoulders above the other whites for me. 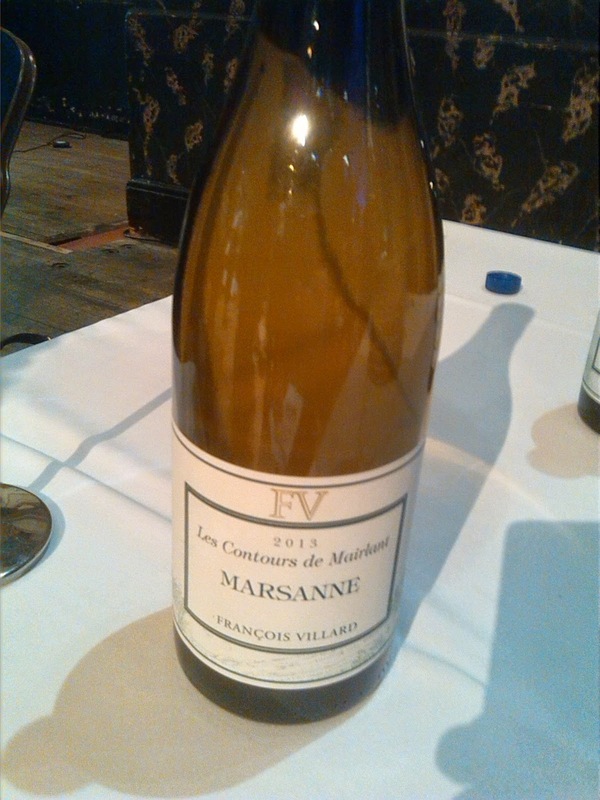 However I will give a nod to Domaine Villard Contour de Mairlant Marsanne which at 12.50 a bottle had some real freshness and verve and while lacking the depth of the Condrieu had a smattering of its class. 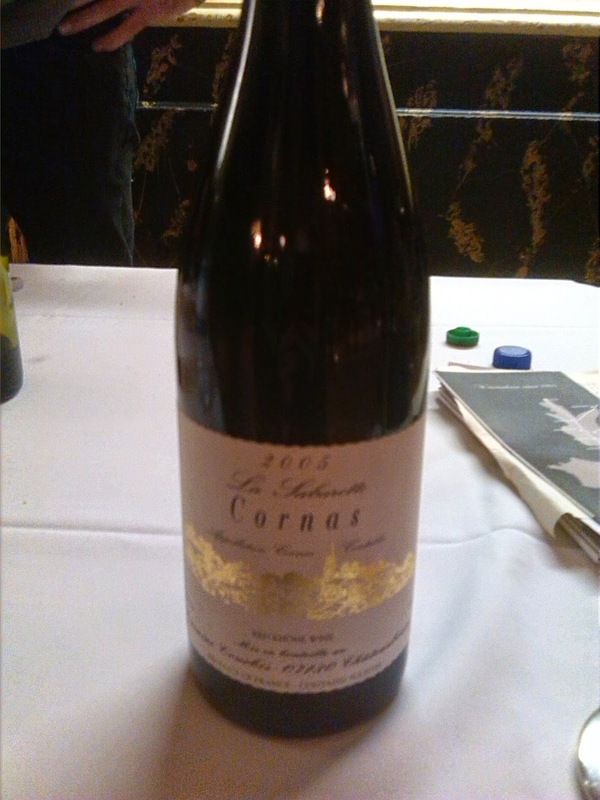 Cornas is a smallish appellation below the larger St Joseph and it's South facing vineyards give wonderfully ripe Syrah fruit that is often the first to be harvested across the Northern Rhone. Both these wines exhibited real concentration of flavour without ever straying into jammy over extraction. There was a savoury almost herby oilyness with the Sabrotte just ramping this up slightly and offering a bit more balance and depth but both wines exhibited a significant degree of class. I haven't really mentioned fruit because it was there but in a Timothy Spall backgroundy kind of a way. 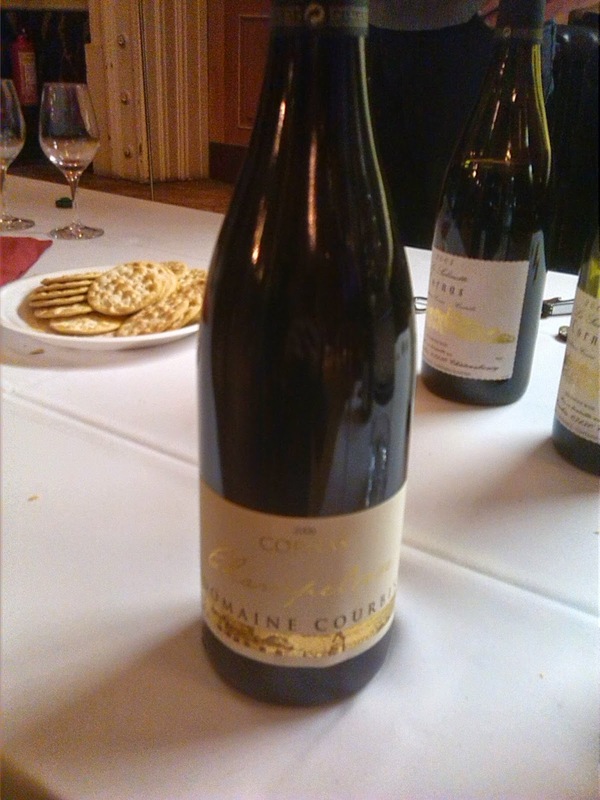 Certainly these had more complexity and depth than anything from the Southern end of the Rhone Valley and indeed for me outshone the more illustrious wines from Cote Rotie which seemed a touch simple in comparison, especially to the Sabrotte. With hopes to achieve appellation status for these vineyards across the river from Cote Rotie this may represent an interesting region to keep an eye on. The wine had more than a hint of the vegetal green pepper note that can be evident on Syrah but the fruit on the palate had a real sweetness and vivacity which suggested a wine of some energy despite having spent a few years in the cellar this was as sprightly as a puppy and equally good fun. 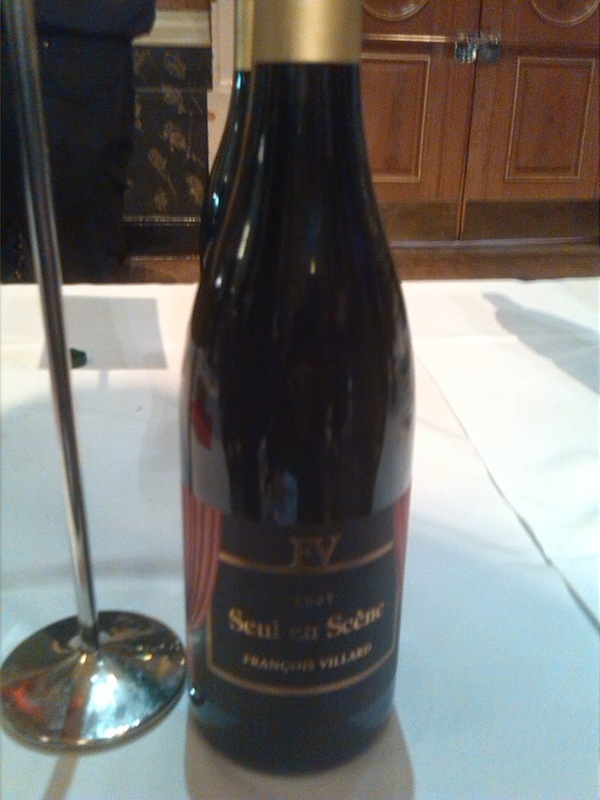 The Syrah L'Appel des Sereines 2012 at £11.50 was a much lighter proposition but still very enjoyable made from younger vines from St Joseph predominantly this had a nice warming peppery spice and red fruit with a little tannin giving it a backbone. There is plenty to recommend both these wines and it probably depends on the depths of your pockets or your curiosity which you would plump for. The Tavel Rose is Domaine Maby top wine from Tavel and iis utterly lovely mde to have more intensity than the normal french rose this is almost like a Clairette from Bordeaux in colour. There are red summer fruits of all complexions fresh raspberries, sweet strawberries and tart redcurrants rub against each other giving a liquid version of summer pudding without the sweetness. 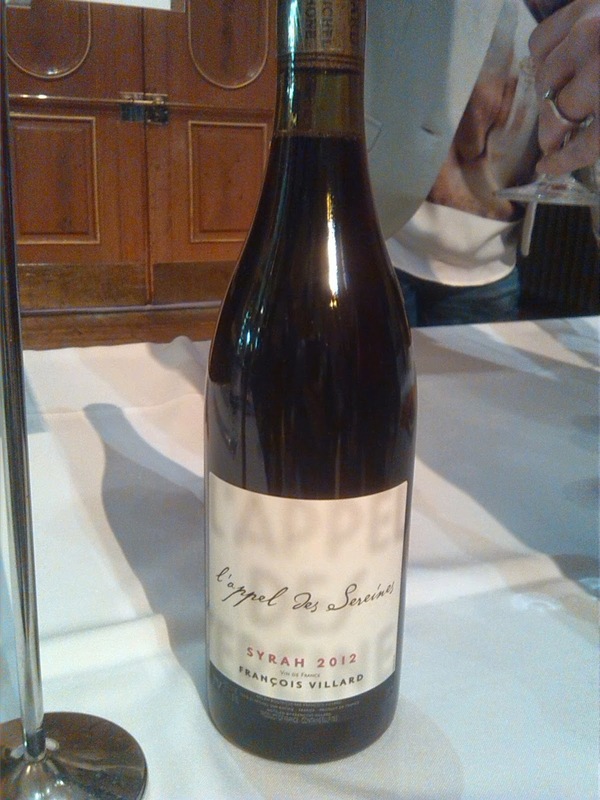 This wine is made from Grenache 55% and Cinsault 45% from a site on a plateau covered in the same kind of pebbles found in Chateau Neuf Du Papes. The White has buckets of white blossom aroma and tropical fruit on the palate stopping short of pineapple sweetness but getting into mango kind of territory. A blend of Clairette Grenache Blanc and Picpoul which retains enough cleansing acidity to balance the big fruit and keep this wine light refreshing and moreish. If you fancy an alternative Kiwi Sauvignon this could be an interesting one to have a go at. Lirac is on the other side of the Rhone from Chateau Neuf Du Papes and as mentioned shares similar soils and geography however thanks to rather too many dull wines it does not have the reputation of it's famous cousin across the river. 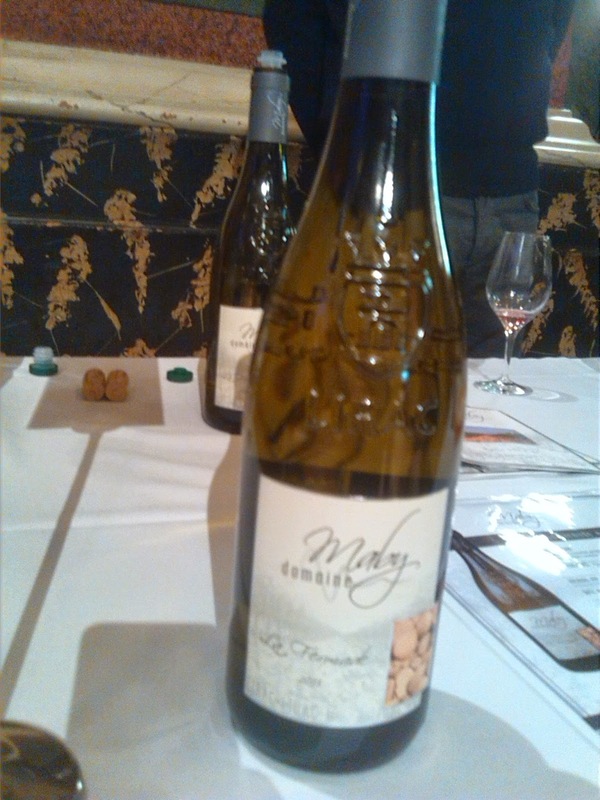 The wines of Domaine Maby thankfully are not dull and have balance and finesse and crucially lots of tasty sweet dark fruit. The wines are alive and balanced with a clear pure definition to them which enhances the expression of the fruit while the finish is a little short it reinforces the simple and enjoyable nature of the wine which is one of the reasons the wines of Southern Rhone are so popular. This is serious wine for people who do not take life too seriously. there is plenty to enjoy but no need to spend hours in contemplation. As you may have guessed Domaine Maby is the wine I will be putting my hand in my pocket to get in a case or two, of the Societies own wines the Cotes Du Rhone by Domaine Jaume was fabulous value while the Societies Exhibition Hermitage Rouge 2007 was a lovely example of a mature wine with still plenty of oompf.